Art by Charles Henry Alston for the Office for Emergency Management. Via the Office of War Information, Domestic Operations Branch – News Bureau. Despite some excellent new scholarship in recent years, the World War II-era films of Walt Disney remain an absorbing and largely unexplored chapter in the studio’s history. The Disney output included nontheatrical educational pictures, training films for the military, and theatrical public-service shorts, all utterly unlike other Disney films before or after the war—and doubly fascinating today because of their rarity. I’ve written about some of the educational films in earlier installments of this column, and Dave Bossert has recently written about one of the public-service efforts, Out of the Frying Pan into the Firing Line. 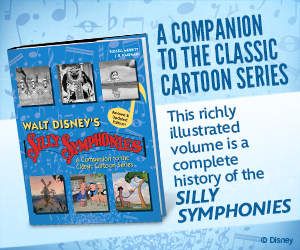 I had occasion to research this film myself in connection with Walt Disney’s Mickey Mouse, the new Taschen book which I’ve cowritten with David Gerstein. 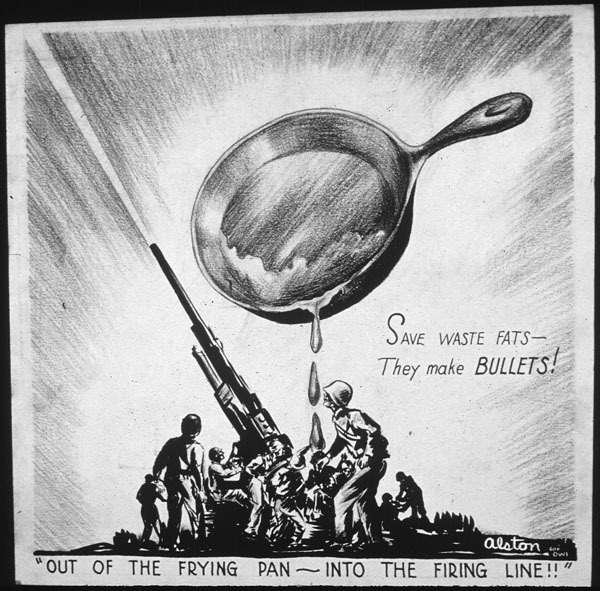 In my case, Out of the Frying Pan was of interest partly because it offered a sight that was rare even during the war years: Mickey Mouse in a military uniform! 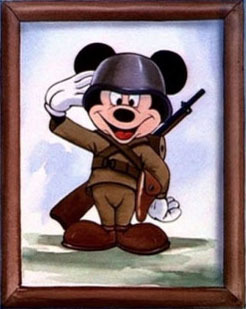 Mickey was as brave and patriotic as the next guy, but during the 1930s the studio had made a point of developing the friendly, nice-guy side of his personality. On the screen, at least, he simply did not fit the role of an aggressive fighting man. Donald Duck was a different story, of course; his short-tempered, combative persona was made to order for the war years. In the wartime Disney cartoon shorts, Donald became the face of America’s fighting forces. Walt told a radio interviewer in 1943 that Donald had gone to war, but Mickey was “sort of on the retired list” for the duration. In the meantime, the Disney studio continued to produce public-service theatrical shorts on behalf of government agencies ranging from the Treasury Department to the Coordinator of Inter-American Affairs. 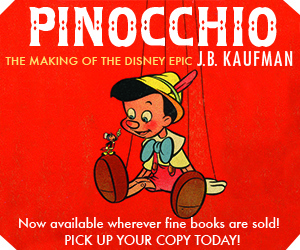 In May 1942, one such government contract was secured for the studio by none other than Kay Kamen, the powerhouse promoter who had already built a character merchandising empire for the Disneys. After negotiating with the War Production Board, Kamen wired Walt that the Board had agreed to contract for a “fat salvage film”—a picture that would impress audiences with the importance of conserving household fats for the war effort. The Board had asked for delivery of the five-minute film in thirty days, but agreed to settle for a sixty-day delivery instead—still a frantically rushed schedule for a short that would meet the Disney standard of quality. This credit list confirms that the film’s rushed schedule didn’t cause the studio to skimp on production value. Animators John Lounsbery and Les Clark, two of the incipient “Nine Old Men,” are on hand here. 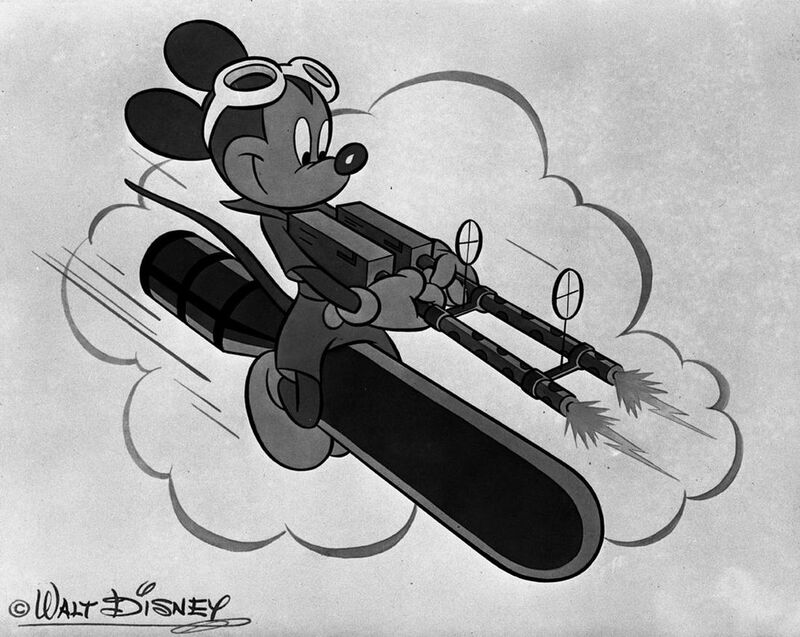 Clark had been a regular animator on the Mickey Mouse series during the 1930s, as had Marvin Woodward; both brought years of specialized experience to the Minnie Mouse scenes assigned to them in this picture. 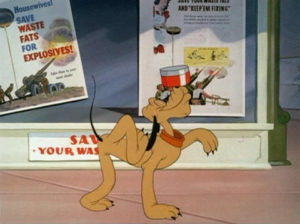 Charles “Nick” Nichols, who animated much of Pluto’s action in this film, would become a prolific director in the Pluto shorts unit before the end of the war. Of course the filmmakers didn’t hesitate to make use of the studio’s existing resources, wherever they could do so without compromising quality. Norm Tate’s animation of Pluto proudly carrying his can of waste fat to the butcher shop, and his return trip with a string of sausages, was based on a scene in the previous year’s short A Gentleman’s Gentleman (which had originally been animated by C.F. Otterstrom), and used the same music that had originally accompanied that scene. The film’s main titles were underscored by an instrumental version of “Yankee Doodle Spirit,” a song written for another Disney public-service short, The New Spirit. And the image of waste grease being poured into a vast whirlpool is adapted from another whirlpool, animated for the climactic scenes of The Sorcerer’s Apprentice. The voice of the radio announcer, who instructs Minnie and Pluto in the fine points of conserving kitchen grease, was provided by Art Gilmore, a voice-over talent familiar to 1940s audiences. Studio cutting records indicate that both Jeannette Tonner and Thelma Peck, separately, recorded lines of dialogue for Minnie Mouse. And the offscreen butcher, who trades a string of “wienies” for Pluto’s can of waste fat, was voiced by none other than sound-effects expert Jim Macdonald. As with their other government-contracted wartime films, the studio worked quickly and efficiently to finish this picture in a timely manner. A story number was issued two days after Kay Kamen’s telegram to Walt, and story work took place during June 1942. Director Jack King and the animators went to work immediately, and by the end of July the production was complete. 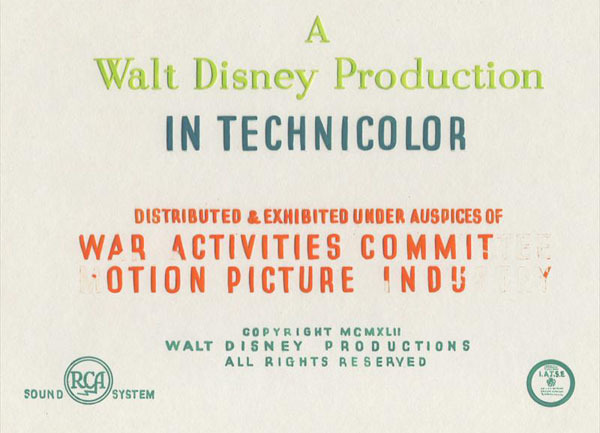 The cutting department finished cutting the Technicolor negative on 27 July, and three days later the finished picture was delivered to the War Production Board, meeting the requested sixty-day deadline. Soon afterward, filmgoers could see Out of the Frying Pan at their local movie houses—a vintage Disney public-service film, conveying a clear, direct message with just a helpful touch of entertainment value. And, lest we forget, including that quick appearance by Mickey Mouse as a fighting man at the front! 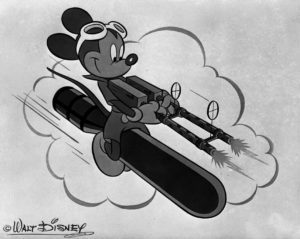 Drawn by an unidentified artist, that very brief glimpse of Mickey in uniform—appearing in the film for all of 28 frames, just over one second of screen time—is only one of the many fascinating details awaiting us as we explore the overlooked world of WWII Disney animation. 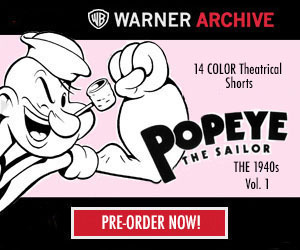 Sailor-suited Donald Duck was always in the Army, while at the same time Popeye was always in the Navy. Wondering if somebody somewhere made sure that no one branch of the military got ALL the top cartoon stars (Bugs Bunny donned Marine dress uniform and marched off to war as the closer on one toon). It’s so intriguing to see it stated so explicitly that Disney had no interest in revitalizing Mickey’s theatrical career during the war years. Of course it made sense to pit the always spoiling for a fight Donald against the Axis, but when Donald wins it usually seemed to be out of luck or coincidence. I wonder what a wartime Mickey short that took a page from the Gottfredson comics and that certain Rabbit from Warner’s might have looked like, with Mickey using his brains to defeat the enemy rather than sheer force of will. Jack Hannah told me in my very first interview with a Disney animator in 1977: “There was a picture that they gave to Jack King about a housewife saving fat for the war effort. I don’t know why they were supposed to save this grease. Maybe it was to make the enemy slip on it. Somebody told me it helped in the making of explosives. There were all kinds of these films being made. “Anyway, Jack King wasn’t interested in the mechanical part of this picture. You know, showing all these cooking fats and stuff going down a funnel and things like that. So he gave me a little section to direct and I just loved it. Just to be able to do something. That was my first little piece of direction. “That opened the door for me. It was at this time that practically overnight there were no more theatrical cartoons being made at the studio. Or so it seemed. It seemed like it was all war work, training films. Fats were a source of glycerin which was used in the making of ammunition. I am a huge JB fan so am very happy to see this (unfortunately limited) series of columns on out-of-the-ordinary Mickey Mouse cartoons. Thank you, Jim — for your kind words and for the Jack Hannah anecdote. This is really interesting, and valuable information that is not available from other sources. Thanks for sharing!